As part of a blog tour organized by Great Escapes Virtual Book Tours, today’s post spotlights Finders, Not Keepers (A Not So Reluctant Detective Mystery) by D. E. Haggerty. I liked Terri and Melanie and the friendship between the two women. Terry is still recovering from her divorce and her friend is very supportive. As implied by title of this new series, Terri is not particularly reluctant to take matters into her own hands when she finds out that diamond’s owner was murdered. She wants to do the “right” thing. If only it was that simple. She decides to find the killer herself. Melanie is all for it. Ryder, her hunky neighbor, is vehement in his opposition. I wanted to like Ryder, however his macho and patronizing attitude annoyed me too much. Having a guy like that tell me what I should or shouldn’t do would be enough to make me do the opposite. Of course, Terri doesn’t listen and finds herself in hot water. The mystery took an interesting course and came to a satisfactory resolution. 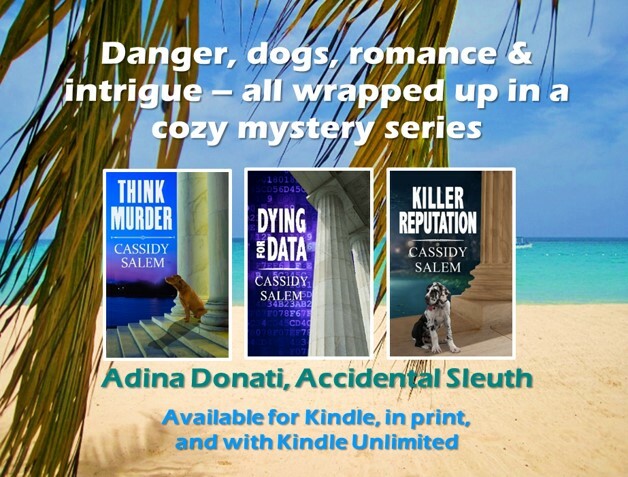 A nice choice for cozy mystery lovers. Click to enter a rafflecopter giveaway for a chance to win a $20 Amazon gift card from the author. As part of a book tour organized by Partners in Crime, I recently had the pleasure of reading Criminal Misdeeds, the first in a new series by a new author. Fun read. Imagine trying to uphold the law when your family is prone to violating the law on a regular basis. Figuring out where to draw the line between family loyalties and her job is an ongoing challenge for Carrie Shatner. And her family isn’t making matters any easier, especially when the crime is murder and the victim is a Palmer. But Carrie is feisty enough to stand up to her relatives – sometimes, anyway. Carrie is candid and entertaining. With a light conversational tone, it is almost as if an old friend is recounting an absurd episode in her life. The plot was at the same time predictable and surprising. The course of events and revelations that led up to the resolution included twists and the identity of the killer came as a surprise to me. This fast-paced mystery is likely to appeal to fans of cozy and other light mysteries. I look forward to reading more about Carrie’s adventures in the future. Excerpt from Criminal Misdeeds by Randee Green. Copyright © 20178. All rights reserved. randeegreen.com 🔗, Goodreads 🔗, Twitter 🔗, & Facebook 🔗!